The Max I. Silber Library at the L. L. Lee Scouting Museum has material for the casual browser as well as for the serious researcher. Essentially complete volumes of Boy’s Life and Scouting magazines as well as Annual Reports, equipment catalogs, and other periodicals are available on request as are all editions and most printings of various Handbooks and pamphlets including the Service Library and Merit Badge series. Lone Scout magazine and older volumes of The Scout (U.K.) are on hand for research. Many reading copies of magazines, handbooks, and pamphlets are ready for use by visitors. Approximately seven hundred titles of Scout fiction appeared between 1910 and 1940. Most are in the collection as is the complete series of the B.S.A.’s answer to the dime novel: Every Boy’s Library. Books by the founders, Baden-Powell, Seton, and Beard, are part of the holdings as are non-Scout books and pamphlets on topics of interest to Scouts. Indian lore, pioneering, campcraft, nature study, and handicraft are a few examples of these. Foreign Scouting literature in English and in other languages is also on hand. The Max I. Silber Library is accessible to the Handicapped and Braille Scout and Cub manuals are available. “For more than a generation the name of Max I. Silber has meant service to youth in New Hampshire and throughout New England.” These words were spoken at the 1973 Annual Meeting of the Boy Scouts of America when Max was given the Silver Buffalo Award, and truer words could not have been said about our founder. Max Silber was born in Manchester, NH in 1911. He was introduced to Scouting in 1923 when he became a member of Troop 1 in Manchester. In 1936, Max became an Eagle Scout, then earned Bronze, Gold, and Silver Palms. He also earned the Explorer Ranger Award and was recognized as a Vigil Honor member of the Order of the Arrow in 1958. Max’s service to the Daniel Webster Council was extensive, holding nearly every job from Unit Commissioner to District Commissioner to Council Commissioner, and from District Chairman to Council President. He was a member of the Council’s Executive Board for sixty-five years. On regional and national levels, Max served as the Region One Chairman in 1957 and on Regional Jamboree Committees in 1960, 1964, 1969, 1973, and 1977. He also served many years on the National Jewish Committee on Scouting. He often said, however, that his most important job was that of Scoutmaster, a position in which he served for many years in Manchester and later in Nashua, NH. In recognition of Max’s service to the Scouting Movement, Scouting has bestowed on him the Silver Beaver, Silver Antelope, and Silver Buffalo awards as well as the Distinguished Eagle Scout Award. He holds both the Jewish Shofar and the Catholic St. George Awards. One lasting legacy Max has left Scouting are his belt buckles. In 1950, Max was chosen to be a Scoutmaster for the National Jamboree. He was in the bronze business and produced souvenir buckles for the event which he gave out as friendship gifts. Over the next half century, Max made fifty more buckles for National Jamborees, World Jamborees, NH Jamborees, and other special occasions as well as recognition buckles for Eagle, Vigil, Woodbadge, and the Silver Beaver. Max’s buckles have become world famous and are considered highly prized collectors’ items. Another legacy of Max’s is the Lawrence L. Lee Scouting Museum, which he was responsible for establishing in 1969. Many of the items on display were collected by Max during his many trips nationally and internationally in the service of Scouting, including items related to Lord Baden-Powell, the founder of the Scouting Movement, and his wife Lady Baden-Powell, with whom Max was personally acquainted. 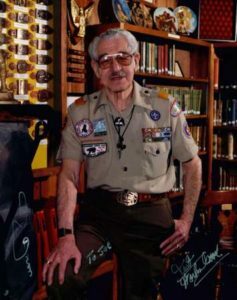 In 1978, the Max I. Silber Scouting Library was named to honor his contributions to Scouting and the community. One of Max’s greatest joys was recognizing new Eagle Scouts. He attended hundreds of Eagle Courts of Honor and challenged each new Eagle to live the spirit of Scouting for the rest of their lives.